Με την αγορά αυτού του προϊόντος μπορείτε να συλλέξετε 17 πόντους επιβράβευσης. Το καλάθι σας θα είναι συνολικά 17 πόντοι που μπορούν να μετατραπούν σε μια δωροεπιταγή των 3,40 €. The G36 is one of the contemporary, alternative options for any player who wishes to stay away from the M4 family of rifles/carbines. The C (Commando) version is the shortest model of the family. The replica is made mostly from light and durable polymer, same as its real firearm counterpart. The outer barrel, flash hider, iron sights, and front RIS rail are made from steel. The model has 3 sling attachement points on the receiver. 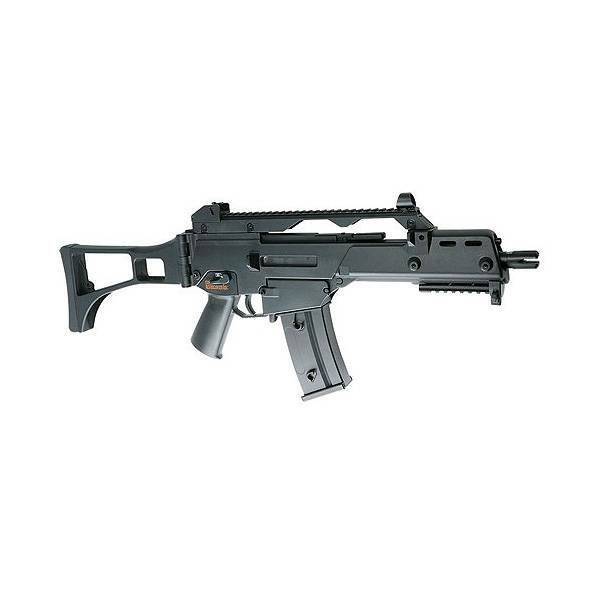 The G36 stock can be folded to the side to help transportation. When folded the model is short enough to play in CQB skirmishes but then, long enough to help with the user's shooting stance. The handguard comes with a 20 mm standard Picatinny rail. The top rail has integrated front and rear adjustable sights. Pulling the cocking lever backwards it reveals the Hop Up adjustement point. The internals are mostly metal to ensure reability. The Version 3 gearbox is metal and compatible with every other Ver. 3 parts. The polymer High Capacity magazine that comes with the gun holds an astonishing 470 rounds that will last fro more than an average skirmish. As with every G36, the magazines can be clipped together to increase capacity. 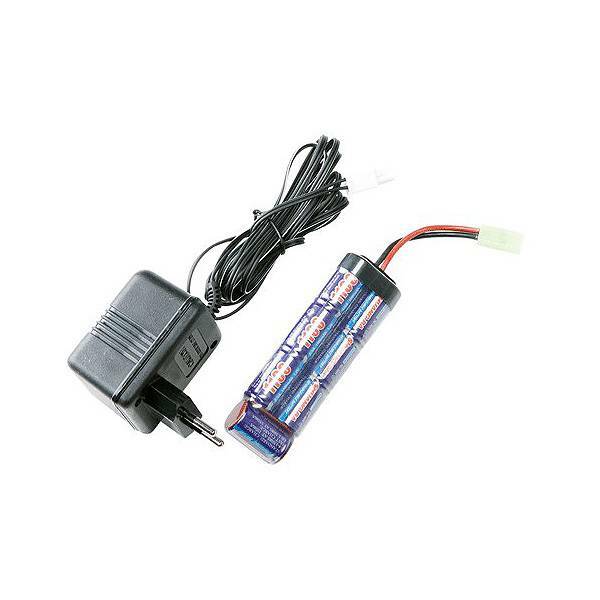 The model uses a Small Type battery that can be stored inside the handguard. The package includes a battery, a charger and a high capacity magazine. 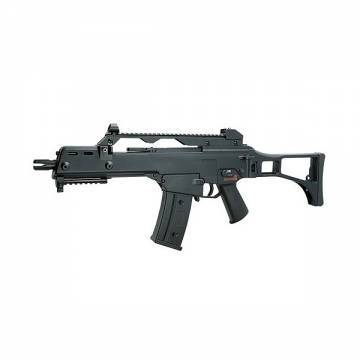 The Heckler & Koch G36 is a 5.56X45mm assault rifle, designed in the early 1990s by Heckler & Koch (H&K) in Germany as a replacement for the heavier 7.62mm G3 battle rifle. It was accepted into service with the Bundeswehr in 1997, replacing the G3. 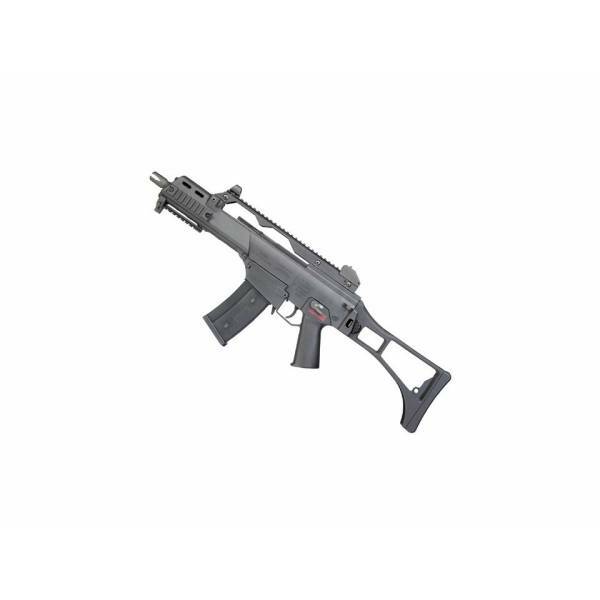 The G36 is gas-operated and feeds from a 30-round detachable box magazine or 100-round C-Mag drum magazine.